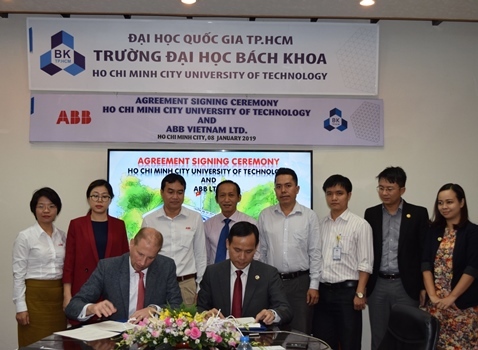 In the morning of 08 January 2019, Ho Chi Minh City University of Technology (HCMUT) and ABB Ltd signed an agreement on offering ABB JDF scholarship program for students of Electrical and Electronics Engineering Faculty. Attending the signing ceremony was Assoc. Prof. Dr. Nguyen Danh Thao - Vice Rector of HCMUT; Dr. Nguyen Le Dung – Vice- Director of External Relations Office; Assoc. Prof. Dr. Do Hong Tuan – Dean of Faculty of Electrical - Electronics; Mr. Trần Việt Toàn – Deputy-Head of Student Activities Office; Dr. Vo Quang Trung - Deputy Head of Student Activities Office. 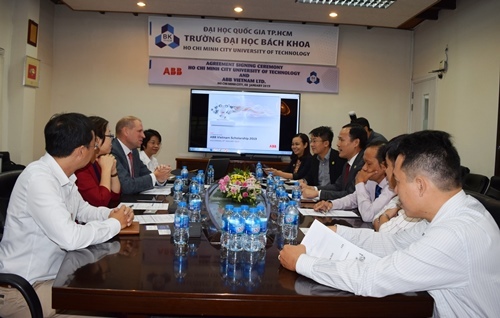 From ABB company, there were Mr. Brian David Hull - Country Director; Ms. Nguyen Thu Giang – Head of Human Resources Department; Mr. Tran Dai Duong - Country Director; Ms. Doan Thi Ngan - Program Coordinator. 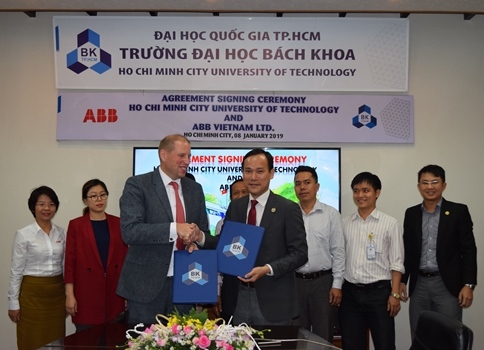 According to the agreement, ABB Group will provide scholarships for students in Electrical – Electronics Engineering Faculty who are in difficult circumstances but have won outstanding academic achievements (3 scholarships/year) with the value equivalent to 26 million VND. Annually, HCMUT will launch Call for applications and send nominated list to ABB. ABB will conduct interviews in 02 rounds. Selected candidates will receive scholarships through personal accounts. This scholarship program will be awarded through the Jürgen Dormann Foundation (JDF) of the global ABB Group. At the signing ceremony, Assoc. Prof. Dr. Nguyen Danh Thao on behalf of HCMUT thanked ABB Group for their supports to the students. The University appreciates the support of domestic and foreign enterprises to students through scholarship programmes. With this kind of contribution, disadvantaged students will be able to overcome their financial burden to focus more on research. In addition, the University will also create favorable conditions to successfully implement this program. Mr. Brian David Hull also praised the training capacity of Ho Chi Minh City University of Technology. He informed that at the company (ABB), there were many graduates from HCMUT who worked very well and effectively. ABB wants to contribute more to the University's training. Signing this agreement proves the group's recognition of HCMUT's potentials. Mr. Hull also hopes that the program will bring good mutual benefits to both sides. It is known that in the past (in 2015), the two sides also signed an agreement on transferring equipment, software, accessories (machinery systems) and provide training for the University officials and lecturers from the Department of Electrical Systems, Electrical and Electronics Engineering Faculty to improve their skills on smart energy distribution. The total value of equipment, software, and sponsorship accessories is 19,586 USD. HCMUT was committed to using the equipment to support teaching for at least 5 years for all final year students of the Faculty of Electrical and Electronics Engineering, as well as students related to energy distribution system major. The Rector Conference with partner universities member of LMPI project.